All parts of the hand have Roman gods names. Why is now the known downward Headline called the Persephone Headline with a Greek name? Why not called the Roman name Proserpine, what is logical.. And what makes this line suddenly so different? All I can say is that the name 'persephone headline' (no.14 in the picture below) was introduced a few years ago at Richard Unger's International Institute of Hand Analysis. This term is very unfortunate and inconsistent. In Europe, the Swiss Alice Funk has adopted this term in her book ''Handlesen the easy way''. She has been trained by Richard Unger. Besides, those markers gifts on your site, I am not so happy, that are the most quaternary lines / characters in the hand that can disappear quickly. Not important enough and hard to see for a layman. Magda van Dijk-Rijneke wrote: This term is very unfortunate and inconsistent. In Europe, the Swiss Alice Funk has adopted this term in her book ''Handlesen the easy way''. She has been trained by Richard Unger. Besides, those markers gifts on your site, I am not so happy, that are the most quaternary lines / characters in the hand that can disappear quickly. Not important enough and hard to see for a layman. Hi Magda, I think I can actually support most of your objections; in the past I have also pointed out that I think it is a bit problematic to describe the simian line and the Sydney line as a 'gift marker'... because in medical science both lines are actually recognized as a (harmless) minor physical anomaly (which implicates that both lines are often more common in populations which have some kind of genetic abnormality, disorder or diseas). Thanks for pointing out that the term is included in Alice Funk's book (I don't have copy of her book). Hi Magda, are you saying that the so called persephone line(deeply diving head line) can disappear/appear quickly? Hi Martijn, I think it is not Sydney line,but, long head line that is considered under gift marking category. 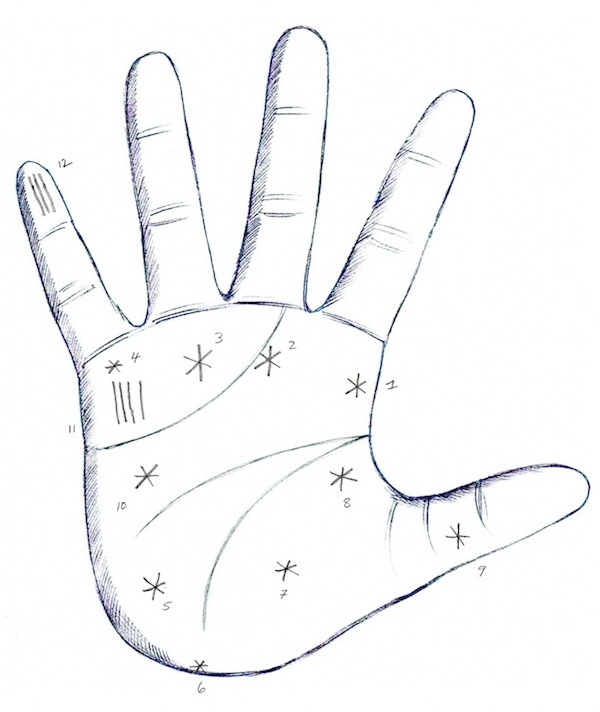 the ulnar border of the palm." (Purvis-Smith, 1972)"
The implication is that formally there is no clear difference between the scientific concept of the Sydney line and the IIHA concept of the so-called 'Hall 9000 headline'. 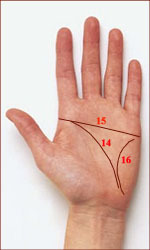 Some IIHA students have described the 'Hal 9000 headline' in terms of a line that "reaches almost the edge of the palm"; however, this is not a description that clearly varies from most of the Sydney line... because formally one could even argue that the edge of the palm starts at the mid-axis of the 5th digit, but such lines are recognized as Hall head lines. In my article about the gift markers I have used the term 'Hal headline'; only after presenting that article I found that there is no clear difference between both concepts. I hope these considerations are enough for you to understand why I often choose to use the term Sydney line to refer to the so-called 'Hal 9000 head line'? I basically make this choice because many people are familiar with the term Sydney line line, while far less people are familiar with the term 'Hal head line'. Thank you for the details Martijn. Yes, IIHA doesn't define the HAL very specifically. It is identified as long head line. But, again, they don't classify it to be something that crosses the palm. The long headline that reaches to the mid section of the little finger is often seen. However, a Sydney, as modified by Wertelecki and other others is something that crosses the other side of the palm completely. Kiran.Katawa wrote: Thank you for the details Martijn. Yes Kiran, there are various definitions for a Sydney line available; but one could say that an incomplete Sydney line (which could be applied to a line only just not long enough to be classified as a complete Sydney line)... could very well be recognized as a 'Hal head line'. Basically, it's a complex issue... and what may look as a complete Sydney line in a handprint (inkprint).. may actually look like a Hal head line' when observed from a photo. And because of this complexity there is no clear difference between a Sydney line and a 'Hal head line', etc. Thanks again for raising the issue. Sorry Kiran, I meant the little mini lines as the star can disappear quickly. Besides the downward Headline is in my opinion no gift marking. If you think that then the Saturn line from the Moon Mountain also are a gift marking. What nonsense and illogical. Both lines are primary lines and even that can change. Only the skin patterns, the purest gift markings are, these never change. I can confirm that I have only heard the term "Persephone Headline" used by Richard Unger's students. Richard developed his own names for various hand features. eg the Hal headline was named after HAL 9000 computer from Arthur C. Clarke's 'Space Odyssey'. Persephone headline goes into deep luna/ Pluto mount, so I can kind-of understand why he chose that name, tho I don't use it. I agree with what Magda & Martijn are saying about 'gift markings'. In my view, the Hal headline & Persephone headline are just 'different ways of thinking' to shorter headlines, and all cases have to be looked at in conjunction with the rest of the hand. eg Headline into deep luna can be incredibly imaginative and creative thought, but can also be associated with depression, which I would not call a 'gift'. Yes, I can support your observations that the so-called 'Persephone line' has also been associated with depression; I think this illustrates that next to my earlier comments regarding the simian line & Sydney line... it is also not easy to understand why this line became associated to represent a 'gift' marker. By the way, we should also be aware that the IIHA gift-markers system is featured with a shadow-side aspect. But from a fundamental point of view one can wonder whether it is realistic to associate a single sign with both a positive- and a negative interpretation... for the gift-marker system this results for the 17. 'gift' signs in a rainbow of 34 interpretations (which reminds me to P.T. Barnum's famous words "we've got someting for everyone"). Though I am sure that the IIHA gift-marker system is not designed to play with people's minds. Maybe the word 'gift' became sort of re-defined in the IIHA-system? Regarding the shadow-side aspects (by the way, in the IIHA system there appears to be a shadow interpretation for any hand sign), some people believe that any problem can be perceived as a 'gift' to learn something... but this holistic use of the word 'gift' implicates that the word should then probably no longer get associated with a real 'talent'... because any normal character feature can then be described as a 'gift'!!!? Though, I should add here that in the IIHA system they do use words like "the super-talented" in reference to the gift-marker system. Maybe it's just a way to describe normal character in a rather unusual vocabulary - by describing relatively common human qualities... as 'super-talents'? PS. Lynn, thanks for sharing your association regarding the Personphone line with Pluto; but it appears that in the IIHA system Pluto gets associated with mars-positive - see Jena Griffiths article (the illustration below is featured in Jena's article). Martijn (admin) wrote: PS. Lynn, thanks for sharing your association regarding the Personphone line with Pluto; but it appears that in the IIHA system Pluto gets associated with mars-positive - see Jena Griffiths article (the illustration below is featured in Jena's article). Thanks I didn't know. I've always associated Scorpio/Pluto with lower luna. Me too, the lower Luna is for me the mount of Pluto and when you know the meaning of it is that makes sense. In some of my 255 books they use the name Pluto for the Ulnar or upper Mars. Under the mount of Pluto is sometimes an other mount to see, associated with the Mount of Pluto. I have different pictures of it. In the book by Rita Robinson she has been talked about a little bit, but I have done further research about this mountain and I have introduce this mountain in my new book. The name is mount of Proserpina Hence my question why Persephone line without a substantiation? Lynn wrote: [Thanks I didn't know. I've always associated Scorpio/Pluto with lower luna. Magda, in Persepone relates to the Roman mythology (and it is known as the goddess equivalent of Proserpina in Greece mythology). PS. Funny how in your perspective the 'Persephone line' could makes sense... because you ascociate the lower mount of moon with Pluto! However, since Jena Griffiths website appears to indicate that Pluto gets associated with Mars positive (see my earlier post)... I assumed that there was no connection between the Persephone line & Pluto. Maybe later in time Richard began to associate Mars-positive with Pluto? Because also in the work of another IIHA student (Kay Packard) we can see that Pluto gets connected with Mars-Positive. The name Persephone line could make sense when Pluto gets associated with the lower mount of Moon; but if the IIHA school has changed their opinion about the mount of Pluto in time... this would implicate that the name 'Persephone line' would no longer makes sense. ... I really wonder if Richard is aware of this??? Kiran, this 1993 IIHA document confirms that in those days the Sydney line was associated with (page 9): "a state-of-the-art computer with no off switch" and "a sign of mental giftedness"; so, this shows that initially the Hal head lilne was described as a Sydney line... and so there is hardly any basis at all to assume that a 'Hal head line' represents another type of line than a Sydney line. Thank you Magda for the clarification. I also noted the names used in RU's system. One of its advantages is it safeguards the knowledge. Do you know what is akashik line? red queen? hermit, gina, donna, 3 for 2, 3rd eye,mising mother's milk, shaman, wow marker etc. Those who know basics of palmistry won't know a persephone or HAL900 line(but, may understand a long headline, deeply curving headline). And the other advantage is, these work as key word and a set of rules, points come to your mind once you get this keyword. The long curvy headline could be named anything (persephone or whatever), that does not matter. Martijn has already analyzed and proved as to why it was named so. But i disagree to the opinion about this line given by Magda. I have known people having this line very well, without other gift markings. Each of them do have a unique psychic ability, no doubt. But because of other positive lines and marks absent in their hands, they cannot use the gift of this line positively. So, one cannot under estimate the importance of this line. What is important is how evolved one is, and not only having gift markings. When one is spiritually evolved, only then all these gifts in totality are helpful or else they are misused by the owner. The downward headline is one of the biggest proofs amongst many other signs that the owner is inspired and has a great sense of imagination. He or she could be a writer,poet, painter,musician,dancer or a greatest devotee of God ( even this needs inspiration) etc which are all related to inspiration obtained from the super - conscious mind. Isn't that a gift in itself ? Fame and success depends on other lines. I think I don't need to specify this to the experts and professionals! They might not be successful, but the happiness and joy they receive through the practice is just like the joy you seem to get from analyzing the endless number of palms of your clients. There can be psychic thieves and robbers also who can sense the particulars before planning to steal. In India there is a region which was famous for very intelligent dacoits. They were a clan who were devotees of goddess Kali. Before their mission they prayed for success, and sometimes even alert people were put to sleep by their prayers. Now these people definitely had these psychic markings but worked in a negative way because of lack of other positive lines or wrong intention. But it solved their purpose. The human mind itself is very complex. To really understand it one cannot read books and find out. One has to do years of inner work. How can you know it unless you go beyond it....... then how can you know other people's mindsets unless you step into their shoes? Even the shadow sides of the gifts are boons,, did you know that? Have you heard of healthy depression? Not all depression or or all boredom is bad... this is all mind-stuff. I totally agree with Kiran's last post on this topic....."these work as key words and a set of rules....."
Likewise I can defend about each and every gift marking with important lines from scriptures whether I personally possess them or not. Sometimes even a person owning a gift marking is not aware what great treasure he possesses and its best use because of his lack of spiritual awareness. Even the gift "stars".....Magda says they arn't important because they may disappear anytime. So what? They are present because of some purpose and tomorrow they may disappear as the need is fulfilled. Whenever we discuss about a particular line or sign,it should be only about that particular line/sin/mark/mound keeping the negative or positive categories aside for the time being and then explain to the laymen about the Influence of other lines.